The famous Peabody Hotel in Downtown Memphis is more than just a nice place to stay. It is also home to one of the city's most famous—and most peculiar—attractions. Each day at 11 a.m., a parade of five mallard ducks, led by an official Duckmaster makes its way from the roof of the hotel down to the lobby. There, a red carpet is rolled out from the elevator and John Philip Sousa's King Cotton March begins to play. The ducks march into the fountain of the Peabody's Grand Lobby where they casually swim throughout the day as people relax nearby at the lobby bar. At 5 p.m., the ceremony is reversed when the ducks return to their rooftop home. Arrive early for the kids to get a good spot along the red carpet. The lobby is always filled with tourists and locals alike wanting to capture a few photos of the spectacle. The attraction is especially popular with families, but adults hanging out in the hotel to savor its historic Memphis feel and enjoy a cocktail in the lobby bar, enjoy the ducks too. Afterward, head up to the roof for some of the best views in the city and to see the Duck Palace. 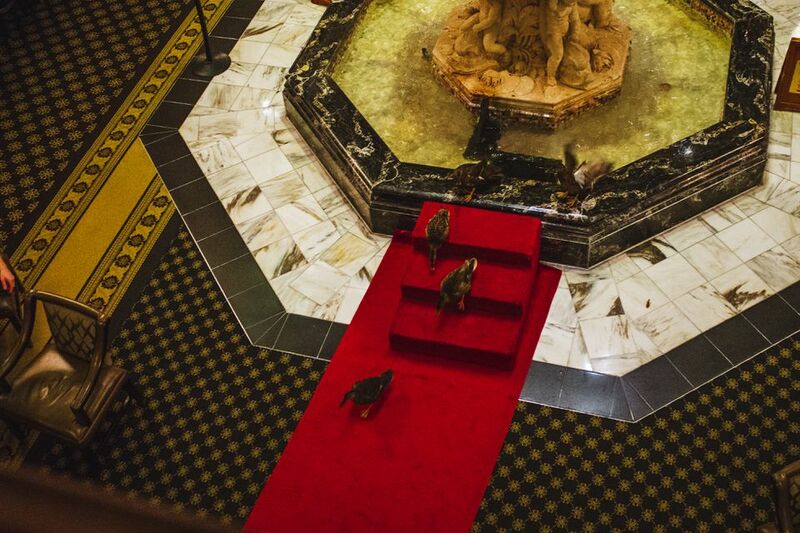 The Peabody ducks live in their Royal Duck Palace on the hotel's rooftop. The $200,000 house is made of marble and glass and features a duck fountain. The palace is a replica of the hotel where the ducks can nest. It comes complete with a grassy front yard. The current Duckmaster is Historian Jimmy Ogle. The Duckmaster is not just an Ambassador for the Peabody, but for Memphis, in general. Ogle has been doing that for years with his Memphis history walking tours. In addition for caring for the ducks now, the Duckmaster conducts tours for the historic hotel. This unique tradition began in 1932 when the general manager of the hotel and one of his hunting buddies returned from a hunting trip in Arkansas. The pair thought it would be amusing to put their live duck decoys into the Grand Lobby's fountain. Intended as a prank, they had no idea how popular the ducks would be with hotel guests. Soon after this stunt, the live decoys were replaced by five mallard ducks. It was in 1940 that a bellman named Edward Pembroke offered to help train the ducks. Pembroke had once worked as a circus animal trainer and soon taught the ducks to march. He was made the official Peabody Duckmaster and kept that title until he retired in 1991. Rumor has it that turtles and baby alligators each briefly graced the fountain in the 1920s but its the ducks that have endured. Each team of five ducks (one male and four females) only work for three months before they retire. The ducks are raised by a local farmer and are returned to the farm when they retire. Duck aficionados can enjoy a special "Ducky Day" package where they can actually help march the ducks as an "Honorary Duckmaster." No trip to Memphis would be complete without a visit to the Peabody Ducks. You do not have to be a guest of the hotel to see the ducks march. In fact, visitors are encouraged to come in each day and witness this fun spectacle.